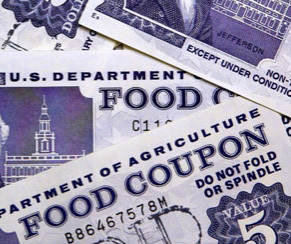 The record increase in food stamps given to poor and hungry Americans has created a fast-growing consumer segment. Businesses are trying to cash in on it by offering hours and goods aimed at those consumers. Last year, the federal Supplemental Nutrition Assistance Program (SNAP) distributed $71.8 billion in food aid, according to a U.S. Department of Agriculture report. That aid went to the 44.7 million Americans living at or near the poverty line. That's up from 28.2 million people in fiscal 2008. The average SNAP household has gross income of $711 per month, or $8,532 a year, and receives $272 in monthly food assistance benefits. About 40 percent of SNAP beneficiaries live in a household where someone is employed, and about half are children, according to the USDA. [The] 1,280-store Save-A-Lot chain opens some supermarkets at midnight, when government benefits are loaded onto food-stamp cards, and promotes higher-priced bulk items early in the month. The chain switches to smaller sizes later as money dwindles and customers make fill-in purchases. Wal-Mart (WMT) also makes adjustments to staffing and product supply based on when benefits are loaded on to cards. Save-A-Lot's parent Supervalu (SVU) says food stamps account for about 40 percent of sales at the chain, an increase of 26 percent over two years ago. SNAP benefits can be used to buy things like breads, cereals, fruits, vegetables, meats and dairy products. (They cannot be used for things like tobacco, alcohol and pet food.) In these tough economic times grocery stores are chasing food stamp users even though the items they buy have lower margins than other foods. Unfortunately, in a time of higher employment and stagnant wages, this is likely to be a substantial customer segment for a while to come.